Peace Now irked at the revelation, blames Netanyahu government; meanwhile, building is up all over Israel. 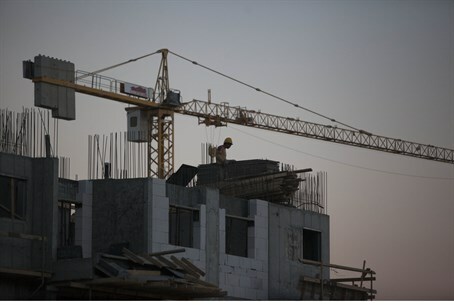 The Central Bureau of Statistics (CBS) revealed Monday that new construction in Judea and Samaria (Shomron) increased by 123.7% in 2013. The announcement surfaces several hours before Prime Minister Binyamin Netanyahu is due to meet with US President Barack Obama to discuss a possible building freeze in the area. The high number is due to the fact that a partial freeze was still in effect at the beginning of 2012, CBS noted, thus pushing off much of that year's construction until the beginning of 2013. Far-left group Peace attacked the statistics, according to AFP. "It's official, the Netanyahu government is committed to only one thing: building settlements," the group claimed. "It shows the lack of commitment to negotiations." The statistics note that the trend is not isolated to Judea and Samaria, however; construction of Jewish homes across Israel rose by 3.4% overall since 2012. The announcement follows the declaration earlier this week that 50,000 new homes will be built in Netanya. While Judea and Samaria saw the most construction by region in 2013, other areas of Israel also saw immense growth over the past year. The Negev saw a 12% rise in construction; Haifa came in third with 8% growth. Jerusalem saw a 3% construction increase; Central Israel, a 2% increase; and the North saw a 1% increase. By contrast, the Tel Aviv area saw a 19% decline in building in 2013. Overall, 41,970 apartments were completed in 2013, up 11.8% from 2012. Of those, one third (33%) were in buildings holding two or fewer single-family apartments.